It is by far the most tedious and time consuming (plus ill be honest – a little annoying!) task in regards to any make-up/beauty routine but alas! It is something that must be done 🙂 When I was first starting out in make-up I did not deep or spot clean my brushes as nearly much as I should have but I have learned my lesson and want to share with you how I go about completing this process. Your make-up brushes need to be cleaned for a few reasons. The main reason is; hygiene. The truth is, there are bacteria in your make-up brushes after use. If you do not clean them, you are transferring this bacteria into your make-up products (which can cause them to go bad a lot quicker than usual) and on to your face which can cause breakouts. 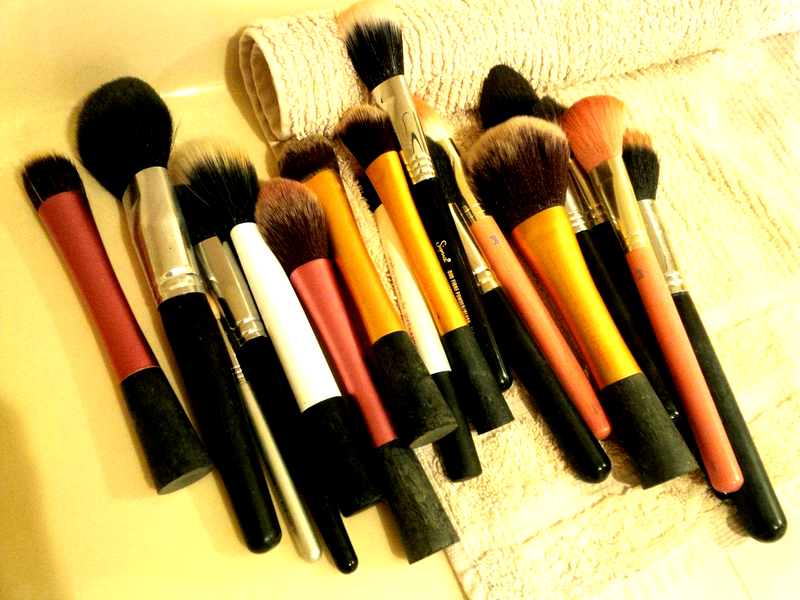 Another main reason in regards to why you need to clean your brushes is; to be able to actually apply your make-up. If there is already product stuck in the bristles of your brush/applicator then it is more likely the bristles/applicator will just grab onto more product and it will not deposit evenly on your face as it usually should (plus you won’t be able to get much product off of your brush!). There are two different ways that you should be cleaning your make-up brushes. The first is to spot clean and the second is to deep clean. I personally spot clean all of my eye brushes and foundation brushes after every use and am able to get away with spot cleaning my powder brushes every couple of uses. What you will need to do this is a brush cleanser and some cotton pads. 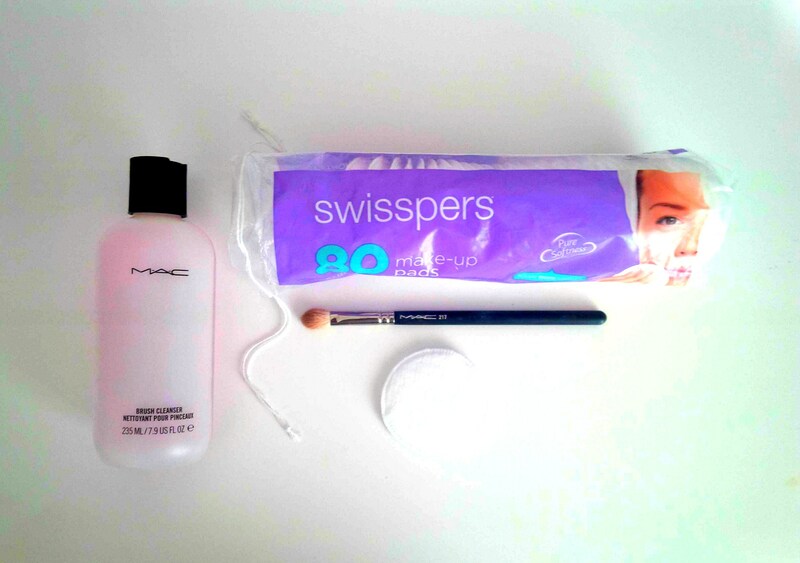 All you need to do is pour the right amount of cleanser onto the cotton pad and then swirl your brush around it, making sure you get all of the makeup off. Depending on how much product your brush has picked up, you may need to do this a couple of times. After I finish doing this, I just wipe my brush on a tissue to get rid of the excess cleanser and lay flat to dry. This is the easy part! The second method of cleaning your brushes is; deep cleaning. It really depends on how often you are using your brushes to determine how often you need to deep clean but I wouldn’t leave my brushes go for more than a month without cleansing. There are sooo many different products and soo many different ways that you can do this but I personally use baby shampoo. I recommend leaving your brushes to dry overnight in this tilted position as it stops water from going up the brush handle and causing damage. By leaving them overnight, it just ensures that your brushes are completely dry before putting them back in the upright position. Your brushes will last longer by avoiding water damage! You will help your brushes to last longer by using softer cleansing agents with less harsh chemicals. Unfortunately, you will see lower quality brushes starting to go bad (bristles falling out/changing texture/hard and rough) quicker than higher quality brushes but you shouldn’t skip cleaning your brushes because of this! How do you clean your make-up brushes? Did you find this article helpful? Let me know your thoughts!